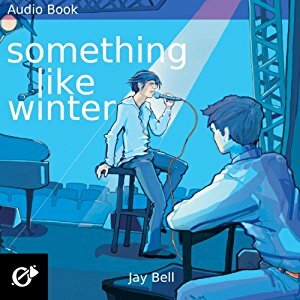 I moved quickly on to Something Like Winter by Jay Bell (with performance by Kevin R. Free) after loving Something Like Summer so much. Winter tells the same story as Summer, except this time the point of view is Tim’s. The two books are the story of a decades spanning relationship between Ben and Tim. They meet as juniors in high school and while Ben falls head over heels for Tim, Tim can’t allow himself to come out to return Ben’s love. The two continue to run into each other over the years, with Tim always looking for a second chance. As much as I loved Summer, I think I liked Winter even more. Ben’s life was good. He was mostly confident in his life and he had good relationships. Yes, there were bumps, but they were over come and life was good. Tim, however, has a more complex and difficult go of it in many ways–partially because it takes him a long time to live as his true self and partially because he can’t let Ben go. As I was in Summer, there are times that I was angry with Tim for what he was doing in his quest to get Ben. However, seeing things from his side, I at least understand it better. It’s also abundantly clear that, in his heart, Tim’s a good person. Of particular joy, and sorrow, was Tim’s time with Eric. Getting the full story on that relationship was in many ways more important to me than what happened with Ben. The other wonderful thing about Winter is that it goes further into the future than where Summer ends. These additional chapters were delightful. I have no doubt that I’ll be picking up Something Like Autumn before too long. That book has Jace’s story (the guy who wins Ben’s heart in his college and post-college years).